No Way Am I Giving Up The Best Job I Ever Had! No wonder the Andrea Horwath Ontario NDP government is propping up one of the most corrupt governments in Ontario’s history. It’s not because of what they can pry out of the government to keep them afloat ( gas plants be damned eh!). It is because 2013 is a bad year to be a dipper! They got hammered in the recent BC election, got hammered last night in Nova Scotia (no matter how much of a spin Lori Turnbull tries to put on it) and are getting killed in the polls that once gave them a ray of hope. Should Andrea do the right thing and pull the pin on this scandalous Liberal government rest assured the people of Ontario will either lose their minds and vote in a majority Liberal government or do the sane thing and vote in a renewed Ontario PC team. The NDP will once again be on the outside looking in. The NDP desperately needs a decent platform to take the voters minds off the failure of that parties government during the Bob Rae years. ( the voters will remember, fair or not,the mess the NDP made when Rae was premier just as the voters remembered the problems of Dix’s past). You get imagine the negative ads in the can about the NDP and Rae days etc. Nope, If Andrea pulls the pin on the minority government in Ontario she will be another statistic in a bad year for the NDP. Despite all the blustering and saber-rattling I would expect that there will be no Ontario election until at least the spring, that is until 2013 gets in the NDP’s rear view mirror. Will He or Won’t he? No Shocker here. Adrian Dix has stepped down as leader of the BCNDP and will hang on until a successor is chosen. This is the right thing to do on two fronts. Stepping down allows the party a shot at renewal and hanging on until a successor is chosen prevents a quack from taking over as interim leader and making things worse. This is a classy move by Dix and he is to be congratulated. We wonder if Moe Sihota gets the message and will get out-of-the-way? What would you do if you were Moe? There will be no lights on here this fall! To no ones shock and everyone’s dismay the legislature will remain closed this fall. Once again the taxpayers get ripped off as the BC Liberal machine avoids discussion and points the spot light squarely on Adrian Dix, Forward BC and the potential mayhem that will come out of the November NDP convention. Dix will announce his future next week ( He’s done like dinner) while the so-called Forward BC Movement wants renewal but refuses to take a position on anything. Although well-intentioned, to renew the party any movement will have to get involved in the leadership area, especially with the executive which is led by NDP dinosaur Moe Sihota. The NDP has more than leadership troubles on the horizon. I would expect fund-raising to become an Achilles heel given all the money they got before they blew thew 20% lead in the polls. No matter how the BC Liberals implode over the next few years ( they will) the business community will be in no hurry to fill up NDP coiffures again after all the money they wasted in the run up to the May election. Like I said in my last post silly season is here! It’s Fall and all is calm but not for long. Silly season is here! The kids are back at school and the columnists are back at work. So are the bloggers. News and opinion goes to the forefront as the summer bids us adieu! Political Insider will be there to follow all the breaking stories and provide opinion as to what is BS and what is not. We will stay on top of Obama’s ( The US Mr.Dithers) and the war on Syria. We will cover Pauline Marois as she tries to drive Prime Minister Harper and the Conservative government nuts(banquing anyone?). Political insider will provide analysis from the BC Conservative AGM and what it means to BC. We will report from on the implosion of the Ontario Liberal Party. You want analysis on the Federal Throne speech and what it means to the country? You will find it here. The new riding boundaries? Look no further than Political Insider as we go inside the campaigns. Political Insider will have all this and more as we speed our way to Christmas and the New Year. Thanks for reading and have a great fall! Adrian Dix and I Clowning Around before Coast Guard Speeches. So as the summer of 2013 races by and fall encroaches on our good times,what will become of Adrian Dix? Will he stay,will he go or will he be pushed out? Who Knows? For one thing the BCNDP has a habit of cannibalizing their own, just ask Carol James. Already there are sounds he will be pushed out. 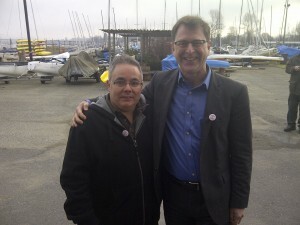 I spent a bit of time with Adrian when the BC Conservatives were working on the Coast Guard file back last spring. I left with the impression he was too nice a guy for the role that was before him. The election itself bore that out. They should have attacked the BC Liberals rotten record of government and scandals. They didn’t and it cost them an election they should have won. My take: If they want to get anywhere four years hence they need to move swiftly to change their leadership without a public head-chopping. Dix should do the right thing and go of his own free will.. This will keep the party united and allow them to change leaders quickly. Another head chopping ala James will be nasty and I think mortally wound the party. Why the short time frame for a change? 1) Four years goes by fast and they need to rebuild more than just the political leadership. Their executive must go as well. 2) The Greens will not sit idly by while the NDP drags their feet and will pick up support on the left. 3) The federal riding changes will be announced in a few short months and if you believe as I do that the BCNDP are merely the West-coast wing of the Federal NDP than you have to know that the next two years will preoccupy them with federal nomination battles. This will eat into their provincial rebuilding in a big way. 4) The provincial party could lose potential leadership candidates to those aforementioned nomination battles. Failure to act now means they will limp into the 2017 BC Provincial election with nothing new to offer. They would open their flank to the Greens and the BC Conservatives, with the possibility that not only would they lose the 2017 election but might not even form the opposition. This would be a disaster they would probably not recover from. Mary Polak : Do you ever know how to BS Mike you even had me going for a moment! Back in the day (2009) Gordon Campbell misrepresented ( goofed,screwed up,lied your choice) about the deficit during the 2009 election. That was the election that brought us the HST and cost Carol James her job as NDP leader. Eventually that error, lie or goof-up cost Campbell his job as well. Move ahead now 4 years to today when the New (lol) Christy Clark government presented a financial update and reported they missed their target by more than $175 million. It could have been worse they said but for the new spending controls introduced halfway through the year. This speaks volumes for the likelihood that their budget that they sailed on during the election will actually balance. In the business world the executive and CEO who reported that would have been sent on their merry way but in the government world this crew was rewarded with a new 4 year term. ( likely 4.5 year term in the election is moved to the fall to allow for budget debate. The most hilarious statement out of all of this comes from NDPer Mike Farnworth who went on the record and said he was concerned about rising debt. Where were you during the election Mike? Why didn’t you and Adrian bring that little tidbit up then? Once again this gaffe will cause an NDP leader to lose his job simply because it illustrates that glaring hole in their election campaign, namely they didn’t hammer the Christy Clark Today’s BC Liberals over their record. Only in B.C can one party lie,err, mislead, or goof up ( your choice) and the leader of the other party get fired over it. Adrian Dix: A Leader I am Not! As crazy as it sounds,today,at the weekend conference of blame the BCNDP is holding to determine what went wrong during the May election,Adrian Dix blamed a large part of the loss on those folks who are blue collar workers and NDP supporters who lost their jobs and moved on . This is a totally illogical statement coming from the man who, without warning, changed his position on the Kinder Morgan project which surely cost them the election. In fact it still has not occurred to Adrian that by opposing this project it would result in the loss of more of those blue collar jobs he has accused the BC Liberals of scaring off. In fact if the BCNDP wants some hindsight into why they lost they should simply read Gary Mason’s excellent column in the Globe. It details for the most part why the Liberals won and how they came back from the dead. From my work in the field during the election,Mason only left out one part of the NDP defeat and it was it important and it was this : After the Kinder Morgan fiasco which led to Dix’s lousy performance at the debate, my field operatives started reporting to me that Dix’s people has told them that Dix was such a wimpster they were staying home and were not prepared to vote for him. The NDP,instead of putting the election on cruise control,should have been hammering the Liberals on their record and their litany of scandals. As for the debate, BC Conservative leader John Cummin’s first line had a prophetic vision attached to it, just not in the way we thought. If you recall he said: You are tuned in tonight because you know Christy Clark and the BC Liberals are going to lose the election and you want to see what kind of premier Adrian Dix will make. The people saw alright and what resulted was a BC Liberal majority! Given His performance in the Recent election ,Clark should give him a cabinet post! This is no ordinary cabinet day, it is being done with a twist. Departing from usual tradition,The BC Liberal government is announcing their cabinet in Vancouver as opposed to stately Victoria. Why? Is it because Clark thinks Victoria culture is so sick she wants to stay as afar away from that as possible or is it more likely she is looking for the grandiose photo-op to give her by-election a kick-start? So what about the cabinet? Will it be large or small? Given the BC Liberals propensity to spend money coupled with so many people wanting to get in , I would hedge my bets on large. Likely Coleman, Mike de Jong, Shirley Bond, Mary Polak and the usual suspects. If Coleman has any say at all Peter Fassbender will be there to carry his water bucket. What about Marvin Hunt,Amrik Virk,Suzanne Anton and a whole host of the new one term wonders elected this past May? What about long time MLA’s Moira Stillwell ( Not to be confused with the other newly elected Stillwell) and Gordon Hogg. Where will they wind up? What about Adrian Dix? Given his performance in that May election Clark should find a spot for him, after all he handed her the election on a silver platter. Adrian Dix: The Best Opposition Leader! Today’s released Angus Reid poll shows Adrian Dix at the top of the list ( tied with Nova Scotia Liberal Leader Stephen McNeil) as the best opposition leader. Perhaps then since Dix has played the role so well he should be returned there after the next election to continue. After all if you are good at something you should play to your strengths, correct? This is after McGuinty saw the writing on the wall and announced his resignation. That would therefore imply that our Premier, Christy Clark,who finished second last would actually be the last once McGuinty leaves. I have been listening to discussions a lot lately about what issue or issues the BC 2013 election will be fought over. One pundit says the economy ( I guess that’s fashionable since James Carville coined the phrase ‘it’s the Economy Stupid!”),another says the election will be fought over BC Rail,another says it will be all about getting rid of the BC Liberals. Some people even say that this election will revolve around the environment or post secondary education. One thing they all seem to agree on is that the government should be framing the ballot box issue. In truth and in fact they are all wrong. These are not issues they are files within a mandate. You don’t vote on the economy you vote on who best to lead you through a rough patch or who to lead and manage a good economy. BC Rail? You are not voting on that, you are voting on who best to lead the legislature to make sure that never happens again? The environment? Post secondary education? Those are not issues; the issue is who best to lead the province in the right direction and manage those two files. The pipeline? Just another file. You vote on who best to handle the file. The Government frames the issue right? They should be. Gordon Campbell ( no matter what you think of him) was very good at framing the leadership issue. He won three elections. He also left when he realised he could no longer frame this as his issue. Today the government is no longer setting the pace on the main issue for the upcoming general election. If you believe the polls the BCNDP are framing the issue of leadership for the government. 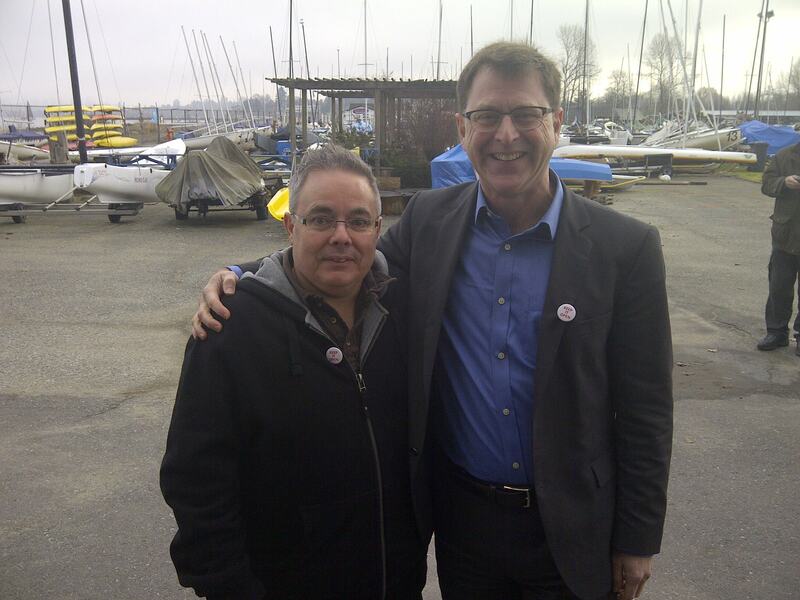 Adrian Dix is waging a very calculated and to this point successful campaign showing himself to be the best leader. He is including everybody in the discussion and is not afraid to release bits of his platform. A case in point: His recent speech at the Vancouver Board of Trade. he told a largely pro business audience that if successful in the election he would raise corporate taxes back to levels of 2008. He is showing extreme confidence and speaks with out emotion. He lays claim to wanting to do politics differently and backs it up with statements like” If the Federal government changes their mind and does not close the Vancouver Coast Guard I will be the first one to issue a press release applauding the government and that decision. Contrast that with the premier who, when asked on a radio show ( Bill Good to give credit where it’s due),to comment on the polls showing the women’s vote is going to the NDP said after a few callers phoned in, it’s early,people are not paying attention and I plan to run on my record. What the premier should have said was’ those polls are on me, I am the leader and I have seven months to work hard and prove that I am the right person for the job. So as of right now the she is right, she will be running on her record.It is a record of not taking simple leadership of a simple question. Likewise the optics from the recent BC Conservative AGM and dissident fiasco were not good for the party and when contrasted against the backdrop of Adrian Dix’s handling of George’s Heyman’s position on fracking ( George is entitled to his opinion we welcome discussion here) once again gave the voting public something to compare them to. There are seven months to go until the election. To be successful the BCNDP needs to continue what they are doing, the other parties have to catch up. What do you think will happen?